How do I add my information to Dewis Cymru? What happens if my ‘sign’ in fails? Ready to add a resource? 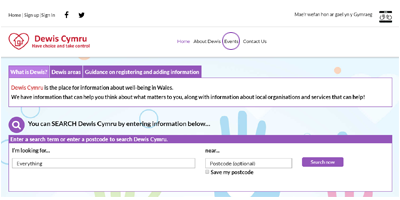 You must register on Dewis Cymru before you can add information about a service or resource. Those adding resource information to Dewis Cymru are referred to as ‘Journalists’. The registration process also allows you to ‘sign up’ to receive an electronic copy of the Dewis Cymru newsletter, which is usually produced every two or three months. From the home page, click ‘sign up’ to navigate to the ‘Create a New Account’ page and add the following information. Display Name: This will be the name displayed in the system when you are signed into the site; please use your name or your first name initial and surname. Email: This should be the email address that you want the site to use to communicate with you. As part of registration, the site will send an email to this address to activate your account. You will then need to use this email address to sign in. Password: Your password must be a minimum of 7 characters long. Local Authority: Which County are you based in? You may have registered some time ago and forgotten that you have registered. This does happen sometimes! So if you get a red message to say that your ‘email address already exists’ when trying to save your details then you can just ‘Sign in’ instead. Forgotten your password? - if you have forgotten your password use the ‘Forgotten your password’ link at the bottom of the ‘sign in’ page. You will need the email address you registered with. You’ll then receive an email with your password. Remember please be careful if you 'copy' and 'paste' this new password into Dewis Cymru to avoid any unwanted spaces which may mean that your sign in will fail. you’ve not left CAPS LOCK on. You can add your organisation’s logo to resources you ‘own’. To add your logo go to ‘My account’, then click on the ‘Profile’ tab. Then ‘Upload photo’. Your image will show in the title of any resources you own. Once you have signed in you can add and edit your resource (resources are services, organisations, groups, clubs, meetings, events etc.) in Dewis Cymru. Click on the ‘Manage resources’ tab. you do not have to enter all your information at once - you can enter minimal information (your resource classification, name, at least one contact method and where you provide your resource) and then choose 'Save your changes'. if you don’t 'Save your changes' at the bottom of the page your information you have entered will not be stored in Dewis Cymru. once you’ve saved your changes you can then come back to your resource information at a later time to add to it or edit it. if you hit your browser's back button or close the browser window without saving changes, your information will not be stored in Dewis Cymru. don’t forget to complete all mandatory fields. These are marked in purple ‘this information is required’. click on the help for more information. there are character limits at the end of each field. These will turn red if you go over them. Also, when you save your resource you will get invalid messages. Remember to think about your obligations as an organisation to provide your details in Welsh. There is a ‘Welsh text’ tab next to ‘Details’. It allows Dewis Cymru to require additional information about resources within a particular classification, which would not be appropriate or relevant to other types of service. For example, for childcare classifications, additional questions are asked about the service. It also enables Dewis Cymru to identify regulated services. 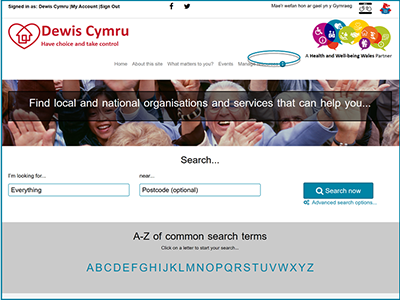 It enables Dewis Cymru to adjust the information displayed to users for particular types of resource. It allows particular types of service to be allocated to specific Editors, so that only those Editors with knowledge of that type of service can publish resources. See ‘What Happens Next’ for more information. It's important to note that whilst all types of service should fit within one of the classifications, the system is not intended to provide an exhaustive list of every specific service type. *Service name: add the name of your resource/service/organisation. Remember if you have a service that has a branch in many local authority areas we’d suggest adding the area e.g. Bridgend Food Bank rather than just Food Bank or Debt and advice information - Conwy Citizens Advice etc. What does your resource do? : add a few sentences that briefly describes your resource. Think about the types of terms that users would use to search. The more user friendly terms in your information the easier it will be for users to find you. Who is your resource for? : Are there any eligibility criteria for people to access your resource? Is there anything people need to know about accessing your resource if they are thinking of coming along? For example – older people aged 60+ or parents of disabled children etc. *How would you describe the working language for your resource? Please choose: Bilingual, English only or Welsh only. If you choose 'Bilingual' or 'Welsh only' the Iaith Gwaith logo will appear alongside your detail. Can you provide your service using British Sign Language (BSL)? Choose 'Yes' or 'No'. If you choose 'Yes' the BSL logo will appear alongside your detail. Is there a charge for using your resource? : If Yes or Depends then you must add what the charge is in the field provided. Can anyone use the resource or do you need a referral? If so from who? : For example Self-referral, GP referral, or Anyone can use this service etc. Website address: add your website address if you have one. This is a good way to signpost to a specific page on your website. Outcomes: Tick no more than 5 outcomes. These relate to the national information pages that can be accessed from the homepage e.g. Being social, Being well, Being at home, Managing your money, Being safe and Looking after friends and family. You do not have to tick any and if you don’t it will not affect your resource in the search results. *Do you deliver your service nationally? : You need to tick ‘Yes’ or ‘No’. Remember to always click ‘Next’ once you’ve made your choice. For example, if you click ‘Yes’ I provide my service nationally then click ‘Next’. Wales appears as the area you provide your service. The same applies if you choose ‘No’. Each time you choose an option click ‘Next’ until the area you provide your service in appears. 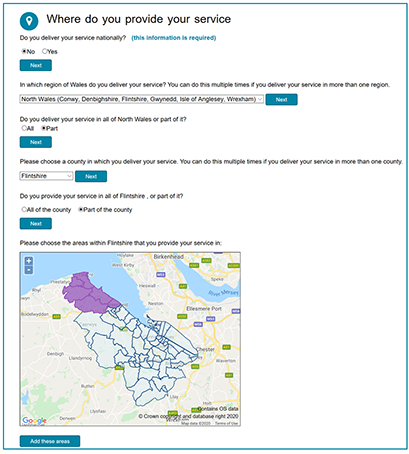 Remember – if you provide your service in both Gwynedd and Denbighshire you can add both of these areas. Just remember to click ‘Next’. You can go as low as ward level. The options include: telephone number, textphone, out of hours telephone, mobile phone, fax, email, web enquiry, by post and in person. If you have a ‘visitable’ address; someone can visit you at your office, community centre etc. then add an ‘in person’ address. This allows users to see your service with a push pin on a map and by entering their post code can receive driving, walking, cycling and public transport directions. Remember to always click ‘Save this contact method’ each time you add a new contact otherwise they will not be added. Social media: add your Facebook, Twitter and other social media profiles if you have them. You can add more than one. Just make sure you click ‘Save this profile’. Opening times and accessibility: add any days/times when people can contact you. Also, if you have a visitable address make sure people know if the building is accessible e.g. lift, ramps etc. The responsible person: The responsible person is the person who will update this information in the future. When signed in the system will automatically populate this field as the person signed in. Feedback email address: you may also want to include an email address so that you can receive feedback about your resource. The review date: this is a date which you set. When you add a resource by default the review date is 6 months (the maximum number of months you can set). For example if you were adding an event you’d want to set the date the day after your event, so that is automatically removed from the system. -14 days after your resource has expired. When you click ‘Save your changes, you will see a pop up asking if your information is ready for approval. If you tick ‘Yes, please review’, your information will be sent to an Editor to publish. You can choose, ‘No, I’m not ready yet’ and you can come back to your resource at a later date. If you choose ‘Yes, please review’, you will also be asked to consider your obligations under the Welsh Language Act? You can add in any translations via the ‘Welsh text’ tab on the main page. If you are just saving any changes a timer will appear while your changes are saving. Sometimes this may take a approx. 30 seconds. Once saved you will see a pop up that says ‘Your changes have been saved’. * Why isn’t my information saving? : Often if your changes won’t save it is probably because you’ve not completed a mandatory field (and remember you may think you’ve completed them all but did you click Next or Save this contact/profile?). Or sometimes it could be because you’ve exceeded the character limit. Dewis Cymru will tell you which fields you’ve not completed. Once saved your information will be visible to an ‘Editor’ within your local area. Once they’ve checked your information and are happy they will approve (publish) your resource. This may take a few days. Your resource will then be visible on Dewis Cymru. You will receive an email to let you know that your resource has been published. If you run events, why not add them to Dewis Cymru? To add an event complete the steps above but choose 'Event' when choosing your classification. If characters permit, try to consider adding in the time, date and place in the 'Service name'. You’d expect most events to have a 'visitable' address e.g. the village hall, church or school etc. so always make sure you add an 'in person' address in the 'Contact methods' section. 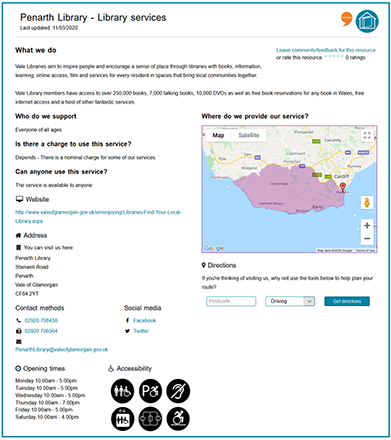 This allows users to see your service with a push pin on a map and by entering their post code can receive driving, walking, cycling and public transport directions. Once you've completed all your information go to the 'Finally / about' section. Change the 'review date' to the day after your event. This means the system will automatically remove your 'Event' from the system, so you don’t have to do anything. Neither will the system send you notifications to remind you to update your information. Once your event information has been approved it will be visible in the site. It will also appear in the 'Events' section which can be found by clicking the 'Events' tab on the homepage. What do I do if my details are incorrect/have changed and I need to amend them? : You can edit your resource at any time. Maybe your telephone number has changed, maybe your opening times increase or maybe you need to edit the area that you provide your service. All you need to do is ‘Sign in’. Go to ‘Manage resources’. Any resources that you are responsible for will be shown in ‘The resources I am responsible for’ link. It even tells you the number of resources you are responsible for. Click ‘Edit’ on the resource you need to amend and amend the fields as appropriate. Remember to ‘save your changes’. My resource is expiring/has expired? : If you receive an expiry email asking you to update your resource, then simply ‘Sign in’ and review your content. If nothing has changed that’s fine but you must ‘save your changes’. If your resource is in the expiry period then Dewis Cymru will automatically set a new review date of 6 months. When you ‘Edit’ your resource it becomes ‘pending’ and not ‘published’. Therefore it is no longer visible in Dewis Cymru. This is so that an ‘Editor’ can approve your changes. Once approved your resource will be visible in the system again and you will be notified by email. Once you have said that your ‘Resource is ready for publishing’, your information will be reviewed by an ‘Editor’ before it is published for general viewing on the website. The Editor(s) who review your information will have an understanding of the type of resource you are adding information about. This provides an important additional layer of assurance about the reliability of resources, and also largely removes delays and difficulties in getting resources published. Occasionally, an Editor might contact you via email to clarify some of the information you have entered about your resource. This could happen if an Editor thinks some of the information you have entered might be confusing, or could be improved. This is to ensure that the people visiting Dewis Cymru are provided with good quality information and advice. If you need help and support, use the ‘Contact us’ tab at the top of the homepage. A member of the Dewis Cymru team will be in contact. The following notes have been produced to help you to add information about your resource to Dewis Cymru. 8. Having a good life. You may want to consider whether the resource information being added to Dewis Cymru fits with this definition and would be of benefit to people using the website. A means of doing something. As with the definition of well-being, you may wish to consider the above definition when considering adding resource information. These standards have been developed in consultation with citizens, professionals and providers across Wales and are intended to assist you in describing what Dewis Cymru quality information could look like. For the information held on Dewis Cymru, quality, relevance, reliability, trust and impartiality are the key principles if the Directory is to be successful over the long-term. Useful The information is straightforward and describes the resource fully. Appropriate to Well-being and the principles and aims of Dewis Cymru The information being added is in-line with the above definition of a well-being resource. Accurate The information being entered is correct. Up-to-date Check that the information being entered is current. It can easily be updated later if things change. Written to be understood The information is easily understandable to those expected to read it. Consider for instance, if the general public will understand any professional terms being used.